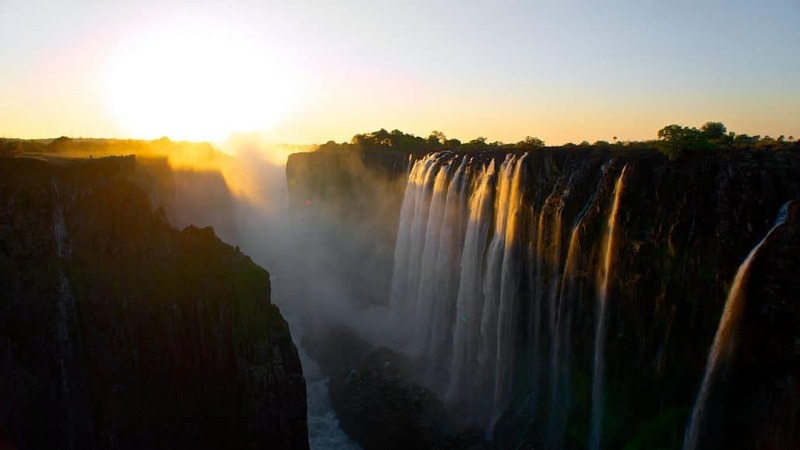 Any visit to Zambia must include the spectacular Victoria Falls – the largest sheet of falling water in the world. The unusual form of Victoria Falls enables virtually the whole width of the falls to be viewed face-on, at the same level as the top, from as close as 60 m, because the whole Zambezi River drops into a deep, narrow slot-like chasm, connected to a long series of gorges. Few other waterfalls allow such a close approach on foot. All seasons offer different perspectives of this the 7th wonder of the natural world. Many adventures activities can be done while here and there is a wide variety of accommodation options to suit all tastes and budgets. The town of Livingstone is just 10kms away. Located in the Great Rift Valley of Africa, South Luangwa is one of the worlds finest wildlife reserves. It supports large populations of Giraffe, and herds of elephant and buffalo often several hundred strong, while the Luangwa River supports abundant crocodiles and hippos. It is famous for excellent walking safaris and good carnivore sightings. A little further north is the more remote and wild North Luangwa National Park, where most game viewing is done on foot. This Park spans the banks of the lower Zambezi River and expands to over a kilometer wide in places, dotted with islands and channels. Elephant buffalo and waterbuck cross freely from one side to other. Birdlife is abundant and the scenery spectacular. Canoeing safaris are a very popular and relaxing way of viewing the action, and tinged with excitement as the river is full of hippos and crocodiles. Further into the Park on the Zambian side are lion leopard and other plains game. This massive Park in western Zambia has a diverse vegetation as well as a wide variety of game and birdlife. The Busanga Plains in the northern section is home to huge herds of Kafue lechwe antelope and many an interesting sighting of the attendant predators can be seen here. The blue-green Kafue River runs almost the length of the park which has 55 different animal species. A small but unusual park, with herds of lechwe and excellent birdlife. An astounding phenomenon occurs in November/December when millions of fruit bats roost there and the sight of them all taking off to forage at dusk is not to be missed. This is a bird lover paradise with over 420 species. Herds of Kafue Lechwe can be seen enjoying the low lying waters on the plains. Blue wildebeest, kudu, oribi, and buffalo can also be found here. Waterbirds are especially abundant. One of the best reasons for coming to this unusual watery wilderness is the remarkable experience of this infinite flat expanse. The views to the horizon seem endless and one imagines one can almost see the curve of the planet. The birdlife is just magnificent and the sight of thousands upon thousands of the endemic black lechwe, unforgettable. Vast open floodplains, several kilometers wide exist at the periphery of the permanent swamps. These may lie under a blanket of water from a few centimeters to a meter deep from 3 – 6 months a year depending on the extent of the summer rainfall. These shallow waters provide ideal feeding grounds for huge numbers of indigenous birds as well as numerous summer migrants, many who will have traveled the length of Africa to winter-over in the swamps. This massive man-made lake is over 220kms long and 40 km wide in some places. 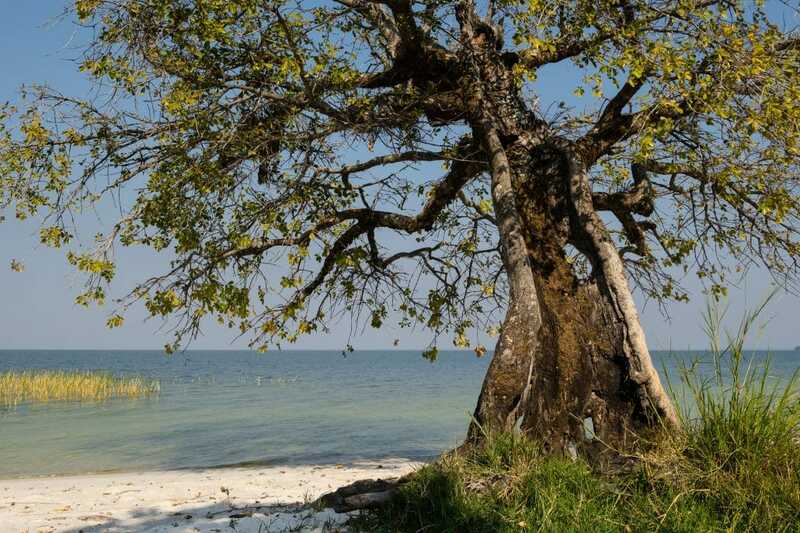 The Zambian side offers several lodges at Siavonga. From here you can take boating excursions, fishing expeditions or simply enjoy the spectacular sunsets over the vast waters. The longest freshwater lake in the World. Excellent fishing and there’s also scuba diving. 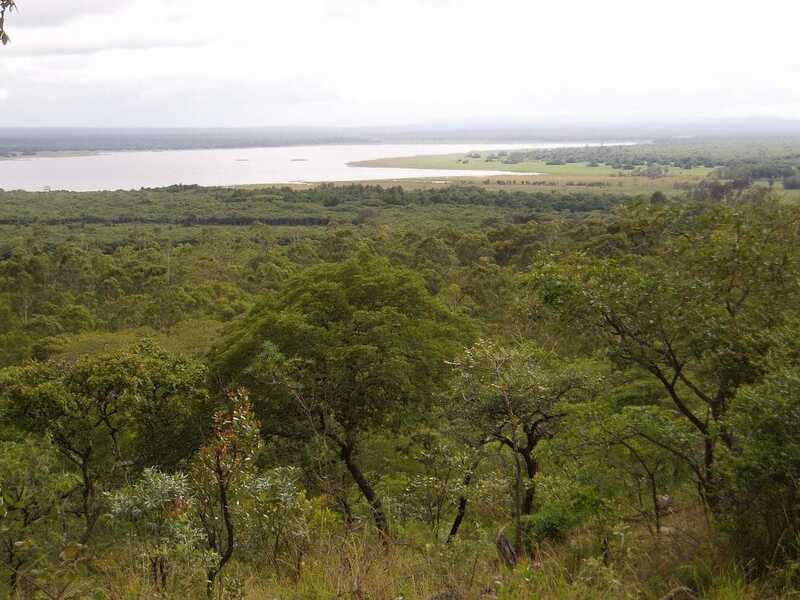 Along the banks is the Nsumbu National Park. A grand English-style country house estate in the Northern Province of Zambia. Its name is based on a small lake nearby, Lake Ishiba Ng’andu which in the Bemba language means ‘lake of the royal crocodile’. The house itself is also known as “Shiwa House”. It was the life-long project of an English aristocrat, Sir Stewart Gore-Browne who fell in love with the country in the 1920’s. It has recently been refurbished and offers a stately stay in one of 5 guest rooms. There’s a hot spring nearby and a game reserve, the lake, a waterfall and hills to climb. Always remember that while some animals have become accustomed to the presence of people they are still wild animals. Keep your distance. It is illegal to feed any animal, make excessive noise to attract their attention, or deviate from designated roads for that closer photograph. Never get out of your vehicle except at designated points. Close all windows and zippers when you leave your room or tent and spray it with insect repellent. The best way to get the most out of your safari is to take an active interest in everything going on around you, not just the number of animals you can see in the shortest possible time. Ask all the questions you can think of and take reference books on not only wildlife but birds, reptiles, insects, and trees and read up about everything you see. There are no specific vaccinations officially required for Zambia. The main exception is for people coming from a Yellow Fever infected area in the previous six days. Nonetheless, it is best to check with your doctor before leaving. Malaria is a problem in many areas of Southern Africa. A course of anti-malaria tablets is highly advisable. In addition, covering up and using insect repellent at night is recommended. Zambia is an extremely photogenic country. From the panoramic scenery, wildlife and birds to people and vibrant ceremonies. Rich color and good low lighting conditions abound. It is considered rude to take pictures of people without asking them first. Always bring plenty of films as it is difficult to get in Zambia. Only print film and processing is available in Lusaka, not slide. Keep your cameras in a dust resistant, padded case and out of the midday sun. A 200mm (or longer) telephoto lens will prove very useful on safari. The Lower Zambezi and the Luangwa Valley, for example, is best for game viewing during the dry season from June to October, but the rainy season, with its spectacular profusion of greens and reds, changes the landscape dramatically and the bird populations increase with the arrival of migrants from the north. Traveling in Africa is a challenge! A safari is an adventure. At times, conditions and circumstances such as road conditions, weather, mechanical breakdown or accidents can be unpredictable and beyond the guide’s control or our control. As a result, the itineraries are flexible and may change depending on local conditions. Please come prepared and make every incident as part of your adventure. Travel insurance is recommended for all clients. Please ensure YOU have arranged travel insurance in your own country prior to leaving to cover unexpected medical expenses and loss/theft of personal effects. All tourists to Zambia with pre-arranged tours with a Zambian Company are exempt from visa fees and will be issued with free tourist visas. (please double check as this rule is subject to change without notice) And where free visas have not been given due to government procedure or staffing problem, Zambian Safari Co will not be liable for this cost. Malaria prophylactics, personal medical requirements, torch, binoculars, camera/video and film, clothing – T-shirts, warm clothing during cool months for evenings, walking shoes, swimming costume, broad-brimmed hat, adequate sunscreen lotion and insect repellents. It’s best to come into the country with hard cash in either dollars, pounds or euros which can be exchanged at any of the many Bureaux de Change in the main Towns. Traveler’s cheques attract a commission when changing to other currencies and not all banks change traveler’s cheques, so to avoid any problems, cash is best.